I’ve baked more fruit crisps in the last few years than I could count on both my hands and all of your toes. And no matter which sweet thing has managed to find its way into my gaping maw between crisps, it’s damn near guaranteed that I’d have preferred that it had been some variety of baked fruit, in its countless incarnations. There’s been an apple-fresh cranberry, apple-raisin, apple-pear, peach, peach-blueberry, peach-raspberry, mixed berry and one day, hopefully very soon, there will be a mango and also a sour cherry. But before we get into my new favorite topping, let me give you a rough outline of the makings of any baked fruit crisp. Fruit of your choice is washed, prepped and coarsely chopped and tossed in its baking dish (usually, a deep dish pie pan, but it can be scaled up easily to a 9×13) with somewhere between two tablespoons (for a not very leaky fruit) to half a cup of flour (berries, I’m looking at you), some sugar (more for rhubarb, way less for peaches), a pinch of salt and some flavoring, be it lemon juice, cinnamon or a scrape of vanilla. Go wild. The topping always begins with melted butter, because it’s the easiest and it has never failed me, a few tablespoons of brown, white or crunchy sugar, and a mixture of flour/oats/finely chopped nuts or just flour. This mix is spread over the fruit mixture and popped in the oven for 40 to 60 minutes, while a resolution-weakening aroma wafts through your apartment. There is simply nothing not to love. But here’s where things were never quite ideal: You see, I’m a topping junkie, and one stick of butter’s worth never made quite enough. Oh, sure, it covered well, but what I really wanted was a big bite topping with every bite of fruit. Yet, uninterested in turning a healthful baked fruit dessert into something with the caloric heft of cheesecake, I refuse to double the topping to a two-stick of butter count. Enter the darling Nigella Lawson. In a pear-apple crumble recipe published in the New York Times a few years ago–which I’ve made, and is both understated and fantastic–she adds a teaspoon of baking powder to a somewhat standard crisp topping and turns it into a crumble, with large rubble-like pieces of awesome, without upping the butter in any way. All this time, I thought I could love nothing more than a baked fruit crisp, and it took a single bite of a rhubarb-strawberry crumble at a Sunday afternoon barbeque to turn my back on the crisp, perhaps for good. With a little leavening, the proportion of topping to fruit is closer to the gloried 1:2 ratio that makes you feel like you’re being “good,” just not earnestly so. Personally, I can’t imagine wanting anything more from dessert. Yields 6 to 8 servings. 1. Heat oven to 375°F. Prepare topping: In a mixing bowl, combine flour, baking powder, sugars and lemon zest and add the melted butter. Mix until small and large clumps form. Refrigerate until needed. 3. Remove topping from refrigerator and cover fruit thickly and evenly with topping. Place pie plate on a (foil-lined, if you really want to think ahead) baking sheet, and bake until crumble topping is golden brown in places and fruit is bubbling beneath, about 40 to 50 minutes. That looks scrumptious, but I have a “secret” to making something similar that’s painfully easy and yet is one of my favorite desserts ever–you take the same steps with the fruit (or use pie filling in a pinch–cherry is fantastic) and top it with a yellow cake mix. Yep, straight out of the box. Here comes the good part: top with pats of butter. Lots of it. (I forget if it’s one stick or two, I’ll have to check). Bake. You won’t believe how good it is. Enjoy! That looks amazing but I am surprised this post wasn’t about S’Mores and Marine’s that love them! That looks wonderful. This sounds like my pie recipe (“a small handful of flour and another of sugar, what kind of apples did you say these were? Maybe more sugar.”) The rhubarb in the kitchen is now destined for a crumble. Have you tried making fruit cobblers? Those are my father’s favorites and I love the topping–practically like a biscuit, and not too sweet–with the baked fruit. Mmm. Making me hungry right now! My mom always made the best apple crisp. I’m going to use her recipe and add the baking powder to see what all the fuss is about. Once rhubarb’s being picked at my local co-op farm, I’ll give that a go as well. Thanks for the hint! Your pictures make me drool. I love crumbles. Okay – I love food in general but these are great. I even adapted it to a single serving. I have some small baking pans from pot pies and will take and apple or berries and just make a smaller version for myself. Or, if I’m lazy and have a pear or apple around, I just cut it in half, core it and then sprinkle topping on it and bake. So yummy! Oh, crumbles — there is simply no better dessert! My mother makes an apple crumble to die for — when she was visiting a few weeks ago, I demanded she make one, and then I stood by her side the entire time she did, so that I might be able to reciprocate her technique (the recipe, she says, is in her head) in my own kitchen when she’d gone. I also asked her to make a spare one and stick it in my freezer, in case for some reason I failed. Oh a crumble! How I crumble for it! (Cheesy, but that’s me!) My list just keeps getting longer and longer. Perfect timing! I just got rhubarb in my CSA farm share today. I cannot wait to try this! Never enough toppping and never enough butter! I agree- crisps and crumbles are one of my favorite go-to desserts. Satisfying and can pass for healthful. What with the leavening, I wonder if you’re starting to get into cobbler territory there? If you’re a topping freak (count me in), I like to do a layer of fruit, a layer of topping, another layer of fruit, and then another of topping. Definitely with all of you regarding crumbles and toppings, the more the merrier. Yesterday I was browsing Baking from my Home to Yours and came across a recipe for strawberry-rhubarb crumble that looks very promising. She uses a bit of candied ginger for the crumble and uses two layers of “topping”, one as a base, then the fruit, then one as a proper topping, and she still uses one stick of butter. You might want to check it out, itÃ‚Â´s on page 240 if my memory isnÃ‚Â´t playing trick on me right now. Now this could could actually turn me into a baker. I am SO salivating right now, just imagining the mix of sweet and tart and crunchy. And besides that, this sounds like the kind of recipes I gravitate towards in general. Not fussy. Just working with a handful of good ingredients in a straightforward way to create something wonderful. I agree that there is generally never enough topping. So if I am the one serving, I usually pull my portion off the top while no one is looking, and divide the extra fruit between everyone else’s bowls, and then strategically place ice cream over it. spooky. Days that I get the cooking bug, I visit your blog, and you always have a recipe that’s in line with what I’m craving. I’ve got rhubarb out in the yard, and organic strawberries at the co-op down the street, that have been begging for this recipe. Thanks! Oh that loos so good, I would like some this very minute! as a self-confessed topping junkie i had to make this immediately and man o man, were you right. 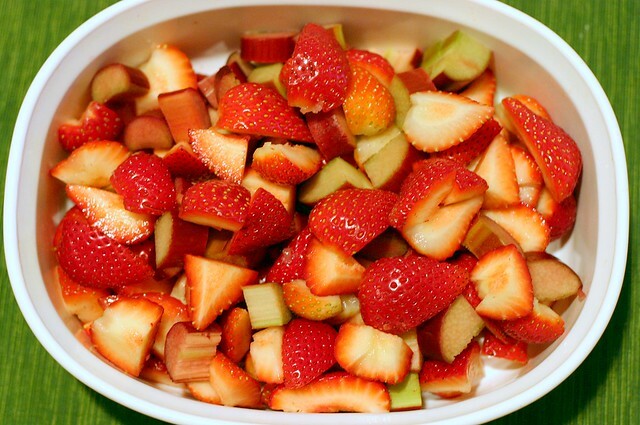 PERFECT topping to fruit ratio. i brought some in to work today. it wasn’t out of the microwave 20 seconds when i hear this “man, what you eatin’ over there?” i sacrificed the last bite to my coworker, who immediately demanded the recipe. kudos to you. How did I miss this lovely crumble? Look at all of those berries. Yum. I made this yesterday with some fresh apricots that needed to be used and strawberries and blackberries. Superb! I doubled most of the ingredients and the folks at work practically licked the empty casserole. Next time I will try it with cornstarch, as the doubled fruit mixture seemed a bit murky from the flour. I don’t think the filling had enough time to really cook through when I doubled it. Seeing the yummy sour pieces of rhubarb mixed in with the strawberries very nearly made me whimper. Oh, rhubarb, how much I miss you. Texas doesn’t understand you, so you’re hard to find, but I love you. Maybe I’ll find you at Central Market this weekend! I love your blog and have recently tried several of your recipes! (Empanadas, black bean salad, and more.) This crumble looks delicious. I’ve used a recipe in the past that uses crumbled sugar cookies in the topping, along with oats, cinnamon, sugar, flour, butter, the usual. I believe the recipe is originally from Martha Stewart. The sugar cookies add a delicious crunch! But now I’m anxious to try your recipe. OH, wow! I made this last night with some strawberries I got last weekend at the farmers market — I got greedy and bought 5 quarts, made two batches of ice cream, six jars of strawberry rhubarb jam, and then had one quart still left! A crumble to the rescue! This was really good, and devoured by my friends and I, but maybe I can sub the white sugar for brown next time? I made this last night for family and it was perfect. I had a ton of rhubarb and some strawberries, and not enough time for a pie, so I went with this recipe–really great! Thanks! I just made this. Have to admit, I sort of approximated most of the measurements because a) I’m in metric zone, b) I’m a poor student and don’t own much in the way of measuring instruments. So everything that’s not perfect about this recipe is probably my fault. It turned out really yummy. Actually, I almost ate it raw because the topping was insanely good. Done and out of the oven, I’d have to say less butter, sugar, flour and lemon zest next time… it’s good, but I think I may just die from the richness (perversely, this didn’t stop me putting some half&half on top). wonderful! though mine did not look nearly as good as what you have posted here, i have been having it for dessert for the last three days, and i must say it improves with age. kept cool and tart and sweet in the fridge, there is no better summer late night snack. My sister just referred me to your blog about 4 days ago and I’m already checking frequently. Your talk of this being a “tweakable” recipe to any current desire and the good crumble to fruit ratio made me head straight for the kitchen. I’m not a rubarb person so I made a strawberry peach version and it was yummy. The perfect amount of tart to sweet and crumble to fruit. The only thing I might modify is a bit less flour because once cooled slightly, it became a bit too jello-like. The crisp looks delicious… somehow despite how simple and easy and fun it looks to make, they intimidate me. But maybe now I’ll try one. Crumbles and crisps really seem to be the thing these days! There are articles on them in several cooking magazines here in France right now. It’s so funny, because when I was younger I didn’t get into any kind of cooked fruit at ALL, and now bizarrely I love apple crumbles… I’ve seen so many different versions of “how to” and tips, ranging from melted butter to completely “hard” butter from the refrigerator, and this confuses me every time… I never know which is the way to go! I tend to make the topping mixes with my fingers, so I try to use soft butter, but I’ve never tried melting it… Last weekend I tried a cherry crumble based on a recipe from Saveurs magazine here in France, and I simply could not get the topping to become crumb-like between my fingers; it was too sticky! I ended up adding way too much flour, and it was soooo frustrating. it turned out OK in the end, although it lacked in the crispy department if you ask me! I want to try strawberries this weekend… Your recipe may become my winner! Thanks for this. I made this last night and it was the belle of the ball! I actually used rhubarb and substituted mixed berries for strawberries (it was all I had) and it was great. I am a new fan of rhubarb and will try the rhubarb/pecan bread next. Thanks for the recipe, and I agree…good ratio. Made this the other night and it was absurdly good. Couldn’t get rhubarb at the last minute, so I just went berry berry and used blackberries, raspberries and strawberries, which worked quite well. I agree completely about the constant need for more topping, this one did the trick. Cheers. Made this for father’s day yesterday and even after a big big BBQ chicken dinner, both hubbie and son had one, two, three! generous helpings, and might’ve gone on… but I annexed the rest to divide among our lunches today. I love that it’s so easy! I hate cutting in butter, so adore the melted butter thing. We added some fine chopped walnuts to the topping since we are nut fiends, and some cinnamon. Ooh la la! and thanks! Fantastic post! love the pics and the recipe! I posted a recipe for rhubarb crumble myself today, but unfortunately i have no final photos becase we eat it before i had time to take pics! My sister in law made your recipe last night for a potluck, it was delish! the only question i had was what the measurements were. What does the capital A with the eyebrow over it mean? Ditto Renee’s comment above. I want to make the recipe but the As with the eyebrows confound me. Renee, Nancy – I believe that’s just a formatting error. If you take out the A, you should have the correct quantities. Thanks Rachel, I’ll note that and try this recipe. Oh, wow, you saved my proverbial bacon today. I had promised to take a rhubarb crumble to a party tonight and then couldn’t find my recipe…This recipe was SO good and SO easy. I doubled it with no problem and took it to a barbecue…people were so full of the amazing grilled salmon most politely declined until one brave soul tried it and started moaning with pleasure. Next thing you know, it’s mostly gone. This was awesome. Thanks so much for this…now I’m inspired to try more! Just thought I’d note that I made a sour cherry-rhubarb version (with a quart of sour cherries and about a pound of fresh rhubarb from the farmer’s market) and it was divine! I upped the sugar in the filling to 3/4 cup to compensate for having only sour fruits in the filling, but otherwise made as directed. Yum! AHA! No cutting, rubbing, or processing of the topping–perfect! I’ve been saving a pound of last summer’s peaches in the deep freeze for just this kind of occasion. Crisp is fine (although the topping gets awfully disappointing after it’s been covered or refrigerated), but this sounds completely awesome. Peaches, get ready, here we come! And Deb, your “surprise me” button is almost as wonderful as your recipes are. I’ve now saved something like 20 recipes on my flash drive plus another 40 or so on my computer at home. 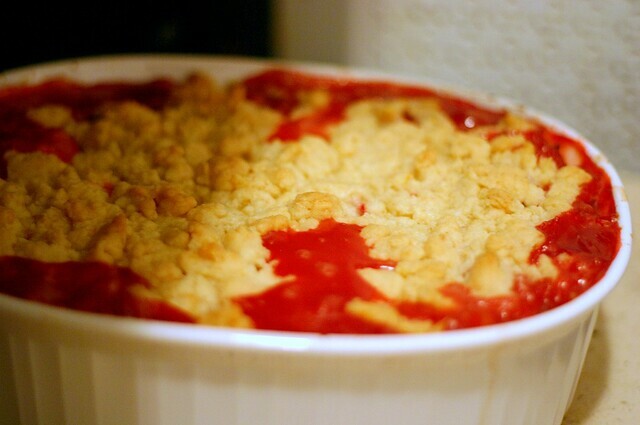 I made the strawberry rhubarb crumble this evening and it was awesome! Not too sweet, not too tart, just really, really delicious. I added some rolled oats to the topping to give it some additional texture. Lovely recipe! Made this over the weekend with freshly harvested rhubarb. Really enjoyed the unique texture of the topping. It held together much better than other oat-free crisp/crumble toppings I have tried in the past, and did not melt down into the filling, another plus. I definitely will try it with other fruit crisp/crumble recipes. Like some others noted above, the flour did make my filling pretty murky even when fully cooked, so I would experiment (with a lesser quantity of corn starch or ground tapioca) if I make this strawberry/rhubarb version in the future. I made this for my morning coffee group today but I wish I had read the comments first. The flour made the filling rather murky and left a taste of uncooked flour in your mouth. I think next time I will use corn starch. I added oats to the topping mixture and it was delightful. A good recipe but I think the flour either has to be cut back or substituted. I got a fresh bunch of rhubarb at the farmer’s market today, and look forward to making this! Thanks for the inspiration, “surprise me” button. While this recipe looks great, I just wanted to add that I always use cornstarch (and not flour) in my crisps/crumbles with great success, especially with fruits that have a high water content (berries, peaches and all stone fruit). I find that more than 1T flour (even pastry flour) can be tasted in the cooked filling, and I don’t like it. If you want to substitute cornstarch (or tapioca/arrowroot) for flour in the filling of this or any pie/cobbler/crisp/crumble, make sure to use half the quantity of flour called for in the recipe. Sorry to hear some people are having issues with the flour. I will update the recipe with a cornstarch swap. Thanks for the suggestions. I made it with the corn starch substitution and it is wonderful! I love it! It’s not too sweet and not too tart. It’s rhubarb season and this will be great for our mothers day lunch. I made this Sunday night with arrowroot instead of cornstarch (I was going to see Michael Pollan on Monday, so corn seemed irresponsible — yes, i have a guilt complex; no, I’m not Catholic), and it turned out beautifully, with the juices thick but rather clear. Also, I stumbled upon thesmitten archives last week, and Friday night I had the opportunity to use the “I’d rather not be some other girl’s problem” line. So, thank you, deb, for putting words in my mouth when I’d otherwise be tongue-tied (pun intended). This was so yummy, Deb! I used frozen strawberries, and I always worry about them producing too much juice when they thaw out…so I added in a little tapioca in addition to the cornstarch:) It was just perfect! Thanks so much, we served it after a perfect dinner of pigroast, Cuban garbanzo bean stew and your slaw tartar. Perfect! Did a variant of this for a cookout this weekend — used 2 ripe red mangoes instead of the strawberries (and used just 1/3 c. of sugar, and tried the corn starch). I’d recommend this combo to anyone looking for a new pairing for rhubarb… the flavor of the rhubarb dominated, but the mango added a lot of fresh juicy sweetness, and the stringy-jelly-type texture of the mango worked well with the texture of the rhubarb. The crisp topping was so fabulous — it’s the first crisp topping I’ve made that I was completely happy with! Thanks for sharing this recipe, Deb. This was amazing! I cooked it exactly as described except 3 TBS of brown sugar instead of sugar in the raw. I hate cooked fruit (was making this out of obligation) and I loved it. Thank you for the wonderful recipe. Finally seeing some rhubarb in my grocery store … this will be the first rhubarb recipe of the year for me! Very excited. Screw the diet plan. 2..what is the difference between a crumble and a crisp? 3..could i use a different type of sugar instead of sugar in the raw? Abby — You can substitute any fruit you want, but you might want to adjust the sugar and flour accordingly. Apples let off less liquid than strawberries. A crisp is usually, uh, crispier, often with nuts and oats. This has cake-like crumbs. You are welcome to use any kind of sugar you want, but I’ve only tested this with coarse, raw sugar. No reason plain white sugar can’t work though. Quick question – should this be refrigerated? Or is it ok to stay out at room temp (covered of course)? It looks delicious – I can’t wait to eat it tonight! For how long? Less than a day, I probably wouldn’t bother refrigerating. I made it late last night for tonight’s dessert. So it should be fine. Thanks! Do you have any other notable rhubarb recipes? I’m obsessed – although I almost think that the big crumb coffee cake recipe is all a person needs. It might be my favorite baked good — ever. Thank you for the introduction! What about feezing? Will this be ok in the freezer in the uncooked state, and then do I allow to thaw or just put it in the oven? Any suggestions? I haven’t tried to freeze it. Do let us know how it goes if you try it. made this for the girls I work with, I’m a hairdresser you know and everyone loved it.made it again for myself today and added blackberries to the mix find out in awhile how this one is, overall i’m definitely very fond of this recipe, very easy and very tasty. I’m a recipe junkie and I search several different ones before I settle…this was sooo easy. I’ve never melted the butter, only softened to get those yummy crumbles. It’s in the oven now and I’ve brewed the coffee…hoping to get some before the baby wakes up and the school bus gets here! Love your blog and plan on coming back often! Thanks! I heart you!! I have about 2 cups of rhubarb and a bowlful of strawberries, and I was hankering for something sweet. You have given me guidance to Nirvana, I am sure. Now, off to the kitchen….. I can’t help but comment here – my grandparents had a farm in Minnesota and my grandmother always made homemade rhubarb “sauce”. I don’t usually make desserts, but I saw rhubarb in the store, bought some and found your recipe. Cutting up the rhubarb brought back many wonderful memories of sitting in my grandparents kitchen (both have been gone many years as is the farm). The taste of this was amazing, not too sweet not too tart, in fact I had a whole serving (not a dessert person)! The topping was perfect as well, I will keep this recipe to use again, especially for potlucks and backyard barbecues. This was excellent, everyone loved it. I added slivered almonds to the crumble topping – it was great. I liked that this is a really easy recipe. It was as good as strawberry pie without the hassle of making a crust. Thanks so much! this is the best thing i have ever baked. it is impossible to stop eating once you take a bite. going, going, gone. Wow. We just made this and it was amazing! Thanks for the recipe! This is the stuff. I made a double batch of the crumble–added a handful of oats–this is enough to cover two pie-plates of fruit and a little 5 x 8 sampler dish. This crumble is JUST RIGHT. Great on blueberries too–the lemon–oh, yum. I’ll be coming back to this page until I have the rhythm of my heart in sync with the proportions of this crumble. Tried this last night… I was going to make a pie, but crust and I don’t get along that well. It was easy, and came out great. Thanks for the posting. 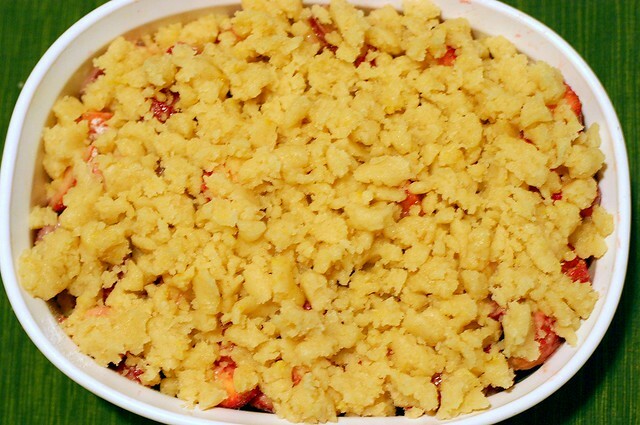 FYI – Found you on Google, you are number one for “strawberry rhubarb crumble”. It’s fantastic – Keath and I both love it! Corn starch change was really good – I would have changed it anyway. Thanks! Hi Ceridwen! Glad it was a hit. Just made this for 4th of July with pitted black cherries and rhubarb – same ratios of everything – and it came out deeeelish. OMG, this is spectacular! And it’s so nice to get an online recipe that calls for a reasonable amount of sugar – most fruit cobbler/crisp/etc. recipes call for SO much that it’s still plenty sweet if you halve it. This is just right! Loved it!! I’ve had this recipe bookmarked forever but just finally made it today. It looked so great, I followed the recipe exactly–something I rarely do! I made three–one to eat now, one to give away, one to freeze. It’s awesome, and now I want to try it with other fruit. Thanks! I made this twice – once this weekend and again last night. The first version was spectacular, though I would use only 3 Tbs of corn starch next time. I too love a good crust/topping/crunchy goodness and this topping recipe was really good. It was so simple to put together and easily doubled. The first version was so good that my dog ate half of it off the counter! The version I made last night included blueberries instead of rhubarb. It was so quick to put together and delish! I would say it takes more time to slice up the strawberries than it does to put together the pieces. Will definitely add this to my recipe book. Upon realizing that I had pears in their death throes (but still oh-so-edible and juicy), I immediately searched SK. Though the bittersweet chocolate and pear cake and pear/almond tart sounded scrumptious, this no-nonsense low-key dessert is perfect after a busy day. It seriously took me twenty minutes to prep, and I’m slow. So I subbed in pears, gussied it up with some blueberries (also in their twilight), and you would not even BELIEVE the smell coming from my oven right now. Will let you know how this combo works, but if it’s anything like your other recipes, fuggedaboutit. I made this the other night and it was delicious! I didn’t have raw sugar, so I used brown sugar instead. I also added rolled oats to the topping mixture and it turned out so well! I will be definitely making this again. hello, I made this tonight and loved it. Also just wanted to let you know I added a link on my blog to this recipe. What a wonderful intro to rhubarb! I found some beautiful organic rhubarb and strawberries at the farmer’s market, discovered your recipe, and decided to make this for Easter dinner. It was a hit, and converted skeptics to rhubarb lovers. Followed recipe exactly, and I will be adding the teaspoon of baking soda to all of my crumbles…genius! Can’t wait to try the chocolate gingersnap tart! Thank you Deb! I made this last night with the first spring rhubarb. It was delicious. I upped the amount of rhubarb and I also replaced 1/2 cup of flour with some oats. I replaced both sugars with brown sugar and it worked very well. I served it with greek yogurt mixed with lemon and orange peel. I loved the addition of baking powder to the crumb. I just made this tonight and OMG was it a hit! I usually just make a crumble by touch – some butter, oats, sugar, etc…so this was a bit different for me and OH LORD was it delicious. It’s my second fab rhubarb recipe of yours in a row (I did the crumb cake a few weeks ago). I’m gonna have to do all of them. This is the best crumble ever! Thanks for an easy recipe and tips to make any kind of fruit crumble. I used flour and it tasted just fine. Yum! Perfectly crunchy topping. I used all strawberries and cut back on the sugar in the filling (only 2-3 tablespoons). I needed to use up some strawberries and decided to go with this recipe. It was very easy to throw together and very delicious. I used a little over a quart of strawberries and adjusted the other ingredients a little since I didn’t have the rhubarb. I think I cut the sugar down a little too much, but sprinkled on some raw sugar after it was done baking which not only sweetened it, but gave a wonderful crunch. I’ve never had a cobbler with strawberries, but think I may have to try it next time! I made this again to try the updated recipe with the corn starch, and liked it even better with that modification. Three Tbs was enough for me. In case anyone was thinking of reducing the sugar content, it did work just fine with half sugar and half Splenda in the filling. I just made this, only used gluten free flour and added in some xanthum gum, and its wonderful! Thanks! Stumbled across this recipe on your blog last year. It has become a staple in my home. Love it! Thank you so much. This is a delightful recipe. I just made it tonight, and the taste could not be better. However, I would like to suggest (should Deb ever revisit this) to say how many cups of strawberries (approximately) you should wind up with. I got my strawberries from a CSA and wasn’t really sure if I had a quart or not, and I turned out to have a bit too much crust-to-filling in the end. But since the crust is heavenly, I didn’t really mind. Made it tonight! Be eating it in about 40 minutes! Made a version that was heavier on the rhubarb (alas it was the frozen variety) and it and the lemon make a great tart crisp. Fell asleep while it was cooling but managed to get a taste before stumbling up to bed! Delicious – peace. This is FABOOOOOOO!! !…….so simple and perfect!…how really good food should be! Yummy! My son bought fresh raspberries and blackberries this morning, then I made a half and half pan–showing my OCD side by keeping the raspberries on one side and the blackberries on the other. I’ll admit I made changes to the filling by using minute tapioca instead of cornstarch. I love tapioca with berries and just couldn’t do cornstarch. It was so much fun to serve the two flavors, but by far the best part was the topping! Thanks for such a good recipe!! I have made this at least 10 times in the last month. Thank you for something so wonderful and easy. I ate the whole thing for breakfast the other day. This looks great. i have plenty of rhubarb in my garden. the strawberry part will have to wait til next year (coz we just planted the strawberries this year & you have to wait) but i have blueberries from a friend’s patch frozen from last year so i’m gonna use those. any thoughts on adjusting recipe? also, for a fruit crisp, what proportion of oats/flour/nuts to fruit do you use? I tried this recipe today with rhubarb from my backyard (which I haven’t cooked with before as I didn’t live here this time last year) and I hated it so much that I threw it away. It was way too tart and sour and lemony. It may be that the rhubarb in my backyard is more tart than what I am used to purchasing from the grocery store, but even if that is the culprit, it still tasted more of lemon than anything else. And the strawberries I used were the best I’ve had yet this year. If I try this recipe again, I would eliminate the lemon completely. I ended up with proportionately more topping than fruit too, even though it wasn’t that way going into the oven. I ended up with a cup and a half of rhubarb and 2+ cups of strawberries. And I made the recipe exactly as stated above (well, I added a pinch of nutmeg). I recently discovered this site, and was thrilled to find this recipe right before going strawberry- and rhubarb-picking a few weeks ago. I made this as the dessert for my Memorial Day picnic, and it was an absolute HIT! I didn’t have cornstarch on hand, so I used 2 tbsp flour instead, it turned out great – oozy and wonderful without being too floury or gravy-like. I can’t wait to try more of these great recipes. Kudos on a wonderful site. As a VERY amateur cook who has recently discovered a passion for all things culinary, your extensive descriptions and interaction with reader comments has been so helpful, and has made cooking seem less scary. Thanks for helping me out! i made the recipe w/strawberries (from our landmates patch) & cut the sugar in half (also used flour instead of cornstarch). Delicious. I made a gluten-free version of this last night that turned our really well. I replaced the flour with 2/3 cup almond meal + 1/3 cup tapioca flour + 1/3 cup white rice flour + 1/2 tsp xantham gum. I can’t compare it to the original version because I haven’t tried it, but the texture of the topping turned out great and the almonds added a really nice flavor. The filling was also delicious — wonderfully lemony and not too sweet. Thanks for another awesome recipe! I made this last night after picking up my CSA share and finding 5 (!) overflowing pints of strawberries. It is awesome. So awesome in fact, that when my night-working husband came home I could hear distinct “spoon-scraping-dish” noises before he came to bed. Sure enough…it’s almost half gone. Such a bright flavor with the added lemon zest. The topping is fantastic, with the perfect ratio of topping: fruit. Loved this recipe – I used 2/3 c. oats and 2/3 c flour in the topping instead of the 1 1/3 c flour, as I just like oats! It was delish! Thanks so much for all you do in your blog – I’m a new follower, and I’m hooked. This was delicious! I used an equal amount of tapioca flour and it was a little gluey, so next time I’ll have to use less. Thanks for sharing your beautiful pictures on your site. i usually love the recipes on your site (and the pics are gorgeous!) but this was disappointing. Was psyched to get strawberries and rhubarb from our local farm. Unfortunately this was way too runny. Maybe need to cook down the mixture first and further reduce the juices?? I knew this was going to happen as soon as I mixed the filling ingredients. Should’ve listened to my instincts. Still tasty, but not good enough to serve to company. I need to do some more research. Thanks for the starting point though! love your site! YUM! And this was ready in the time it took to preheat the oven. A plus in a busy house. I didnt quite have enough rhubarb, so I probably should have used less sugar. It wasnt too runny… just perfect! I used all white sugar. Thanks! I made this about 10 days ago with the last strawberries from the farmer’s market. I increased the fruit slightly with additional strawberries to make 6 cups. It was wonderful, and we enjoyed the crumble for dessert and breakfast! Thanks. I made this last night, but subbed blueberries for the rhubarb, it was delicious, my husband had two helpings! I will be picking up some rhubarb this week to try another one! Thank you! I’ve made this recipe about 100 times now and it has never failed me. It always gets rave reviews…even from my extremely picky husband. Today it’s off to a folk music festival. Just wanted to say thanks, Deb! Your site is always the first I check whenever I need to impress! You are the best person to ask Deb…what’s the difference between a crumble and a crisp? I made it last night for a July 4 shindig. It is the lemon zest that makes it truly great. The topping almost tastes like shortbread. So good. It will be my go-to crumble topping for fruit this summer and I can’t wait to try it with blueberries, blackberries, raspberries and more when they come into season. Thank you, Deb for yet another winner! Your arroz con pollo, boozy baked french toast, and southwestern pulled brisket are also favorites in my kitchen. Made this last night. First time using rhubarb (the girl at the grocery store thought it was celery, so that tells you something) and first time making a crumble (or anything like it). It was DELICIOUS! I’m a newlywed who is trying to learn more about cooking and your recipes are consistently earning high praise from my husband. Please don’t ever stop doing what you’re doing. Can’t wait for your cookbook! I made this twice this summer with strawberry and rhubarb – out of this world! Made it with peaches last night – good but strawberry rhubarb was better. As a gluten-free baker, here’s what I’ve learned from this recipe: bake it first covered in foil for 35 minutes, then 10 minutes at the end without foil to brown it up. The first two times I made this crumble, I baked it without foil, then panicked when it was burning after only 20 minutes, then baked it the rest of the way with foil. Definitely bake it gluten-free with foil from the start, then brown at the end for 10 minutes – perfect! PS – I used Bob’s Red Mill Gluten Free All-Purpose Baking Flour. This is lovely. I just love your blog. just made individual strawberry-rhubarb crumbles in my fiestaware coffee mugs. cute! I LOVE strawberry rhubarb pie, but I am not a confident baker, and now I live in Russia where you can’t find premade pies (they like the hard life here…EYE ROLL) so this is PERFECT for me. I always make cobblers, crumbles, crisps, etc instead of pies. My mom used to make a “Dump Cake” where she dumped a can of cherry pie filling, a can of crushed pineapple in a baking dish, topped with yellow cake dry mix mixed with pecans and topped with pats of butter and baked. It was always my favorite thing she made. Just made this for a family get together and it got rave reviews. I’ve made many fruit crisps and crumbles and this one got the “best ever” award. I followed your recipe exactly and used fresh rhubarb and strawberries. Thank you for a great recipe! Good lord this was delicious. And sooo easy. I had appx five servings yesterday (with ice cream. you know, because I needed to finish it to make more room in the fridge) and while I would normally chalk this up to the fact that I’m about 39 weeks pregnant, it has more to do with how freaking good this is. Can’t wait to experiment with different fruits this Spring and Summer. Thank you for ALL of your recipes! Love your blog. Love that when I searched for a strawberry-rhubarb recipe I found yours. Made it last night for my girls and their boyfriends (one who had never tried rhubarb). Almost gone! I made this last week for a post-Easter get-together, using up a bunch of strawberries that my 6-month-pregnant-self was convinced I could find the time to make into pie(s) for that weekend. It was delicious – not too sweet with a great topping that made my husband start guessing at what ingredient made it taste so good. Thanks so much for the fantastic recipe! dish sounds delish! cant wait to try it out. can someone do me a favour and tell me how much is in a cup ? as is what does it weigh in terms of pounds or ounces?? much appreciated !! and also what in weight is a quart? im new to this baking lark and in ireland these measurements are unfamiliar to me?! thanks! A quart is about 1 to 1 1/4 pounds of strawberries. A pound is 16 ounces. I just made this last night for a little patio get-together, and it was wonderful. I am a huge fruit crisp fan, and like this topping even more than my normal oaty go-to recipe. I really appreciated that no food processor was needed! Thank you! Made this with some of the rhubarb from my CSA and it was fantastic. The rhubarb made it a bit too sharp- tasting for my toddler, but my husband and I loved it. I was out of cornstarch and subbed flour; had no problems with any cloudiness. Thanks for great recipe! This is a terrific recipe! It paired well with a bottle of cava. It’s in the oven, it’s in the oven!! I just came across this recipe today. I had never made a strawberry rhubarb anything before, but had some lovely rhubarb from a relative’s garden to use up! I adjusted slightly, using 2 cups rhubarb, skipping the lemon zest in the topping and adding oats. It is delicious!!!! Thanks for sharing – I am sure I will make this again! This recipe marked my first ever experience with rhubarb. So good! And easy! Thanks! I love this recipe! I got rhubarb in my CSA bag a few weeks ago and went searching for something to do with it. Since then I have gotten rhubarb a few more times and have made a few versions of this recipe now – rhubarb and strawberries, rhubarb and blackberries, rhubarb and strawberries and blueberries. this is delicious! I used more rhubarb because we have a crazy amount coming out of the garden. I also browned the butter in the crumb topping. So good! Just wanted to let the vegans know that this topping turns out fabulously when made with Earth Balance! My vegetarian dinner group demolished two pans of it in 15 minutes flat. after getting my heart set on making this drool-worthy dessert, I went to 3 grocery stores and a farmer’s market looking for rhubarb – couldn’t find it anywhere! Since I had already brought home two beautiful quarts of fresh berries, i proceeded without the rhubarb. cut back on the sugar, added extra lemon zest. it was incredible. nearly the whole 9×13 was devoured! I have made this several times now and it is good. Here are my tips for improvement. 3 – you don’t need the juice for the topping – just add a little more butter – rub it in with your fingers – look for the consistency of lumpy breadcrumbs. Great recipe though – love the blog. We live in Southern California where rhubarb is unknown. After living here for 13 years, I spotted some in the market yesterday and couldn’t run home fast enough to make this recipe. It was delicious and insanely addicting, and reminds me so much of my childhood summers in the Midwest. I’m so happy to know someone made a vegan version, and I agree with Jonathan’s suggestion to lessen the sugar. I think it would highlight the fruit a little more. I have made the recipe before and it was amazing! Even tried it with apricots and peaches and it was perfection. I am making this for two families for the Fourth of July and I am wondering if it is okay to refrigerate it (without the crumble on top) for a day before baking it off? Thanks so much! Have a great holiday! And I wasn’t disappointed at all! This recipe was AMAZING. I halved the sugar in the filling and used flour instead of cornstarch because it’s what I had on hand. I think I might try it again with peaches instead of strawberries if I can find some more rhubarb…. somewhere…. I just made this with cherries, and uh. Oh my god. I can’t even put it into words. I just picked blueberries and was searching for a good peach/blueberry crisp and came upon this recipe. I share the love of the traditional crisp topping, so decided to give this a go. Wow, this is an incredible recipe! I made it exactly as stated substituting peaches and blueberries for the strawberry/rhubarb and using a little less sugar. The lemon zest in the topping was so nice. YUM, this recipe is destined to become the new August go-to dessert. Thanks! I like to use half & half regular white sugar & brown sugar. This seems to blend with the natural fruit flavor nicely. Also, I usually use tapioca starch rather than flour or corn starch. With really juicy fruits, I might put two kinds of thickener in so one flavor doesn’t stand out. Deb, how would you tweak the sugar/flour if using peaches? I made a variation today with plums, nectarines and some apple. With the apple, I needed no thickener for the filling, and I didn’t put any sugar in the filling either as the fruit was all very sweet. i added 1/2 c. of oatmeal and used ww flour for the topping, as well as subbing coconut oil for the butter as guests are vegan. It was great. This is the best crumble ever just as it is… no tweeking needed as far as I am concerned with or with out the lemon depending on the fruit I use. I have made this so many times in the last few years.. just changing the fruit combo to what ever I have on hand… just so quick and easy if you use tin pie fruit. LOVE IT! I stumbled across your blog by happy accident, and I am obsessed!!! I LOVE food and cooking/baking it! I made this recipe over the weekend for Sunday coffee with the parents and grandparents using strawberries and rhubarb from the local farmers. All I can say was this was FANTASTIC! Unfortunately, it looked so good, I forgot to get a picture :o( The crumble topping was TO-DIE-FOR! My family will be going blackberry picking this weekend, and then blueberry picking at the end of June. I hear some berry crumbles calling my name…. Thanks for the recipe and blog! Happy eating! P.S. I am trying your buttermilk chicken recipe this week for my Country Husband–looks and sounds yummy! This is one of my favorite strawberry rhubarb treats! It’s so easy to make and very forgiving. I made the topping the day before and left in the fridge overnight. It was a little dry but baked up just fine. I didn’t have the correct amount of filling ingredients (only had half the recommended amount of berries, and the ones I had were very overripe, so I upped the amount of rhubarb, and ended up eyeballing the amount of sugar and lemon juice instead of measuring) but I used the full amount of crumble topping anyway. Baked it up in a 9-inch cake pan, and the result was delicious! It was almost half fruit/half crumble topping. I wish I measured the fulling ingredients because it’s the perfect combination of tart and sweet. I served it with some homemade whipped cream, and it was perfect. i made this recipe for our memorial day picnic since i had just picked berries and rhubarb. delicious but i found that the cornstarch didn’t seem to thicken up the fruit juice quite as well as flour so i may use flour next time. i LOVED the topping though. the baking powder is a great addition. Love, love, LOVED it! Thank you! Made this over the weekend after my first trip to the farmers’ market for strawberries and rhubarb. Followed the recipe exactly, and it was perfect – seriously perfect. I share all your thoughts and frustrations about fruit desserts and the topping to fruit ratio, so this is a total game changer. Next time I use this technique I’ll try some brown sugar since the brown sugar / butter combo has been what always brings me back to the “crisp”. Thanks so much for this! This is great and the lemon in both the filling and the crumble really shine through. thanks for another great one!! This is a FANTASTIC recipe! I was just looking for some rhubarb/strawberry ratios for a standard crisp, when I saw this. Seemingly simple, but I decided to try it, different topping (no oatmeal) and all. The topping is almost like shortbread, I was eating it raw! Anyway, I can’t think of a reason to ever make a basic crisp again. This is too good and just as easy. I doubled the fruit, but only 1.5 the sugar, corn starch and topping, and that was perfect for us. YUM. so good! thanks for the recipe! I just made this with fresh local rhubarb and strawberries. I think it is the best crumble I’ve produced! It is a force of the will to not keep on taking “taster” bites. Our blueberry bushes are presently going nuts, so I made this yesterday afternoon, and substituted blueberries for all of the fruit, orange for the lemon, and used finely chopped crystalized ginger in place of half of the sugar in the topping. It is phenomenal. So grateful for the extra measure of topping… it allowed me to pick crunchy bits off the top while it was cooling without leaving gaping holes… which is the point, isn’t it? I cannot wait to try this. my sister and i can’t wait to try this! it looks amazing! I have to dip my oar in here. I often do my cobblers this way. Use a pkg of refrigerated pie crusts, unroll and bake one on a cookie sheet. Place 1/2 the fruit filling in the casserole, top with the baked pie crust pie (break into pieces if you need to) add more filling, then top with the unbaked crust. Place in oven and bake till bubbley and top is browned. Wonderful cobbler! Lots of crunchy crust. Top with ice cream or whipped cream. Made this twice in the last 3 days. Amazingly delicious! Thank you so much for sharing this recipe, Deb!! I’m hoping to make this for Thanksgiving at my boyfriend’s parents house – I’ve been staring at these pictures all day and I’m so hungry for it now – I hope I can resist eating it before Thursday! Made this this past weekend and was delicious! thank you so much! the lemony quick is incredibbble! Wrote my wonderful experience with this recipe on my blog today- with a link to yours! Thanks so much! I added cardamom and coriander to the crumble topping. Fragrant and delicious! Is there anyway to make personalized crumbles in a muffin tin? Would it ruin everything? Making strawberry themed purim baskets and hoped to do it! I just made my first dessert ever and it was this crumble and it is absolutely delicious! I used mixed berries as well with the rhubarb (mangoes, strawberries and blueberries). I also only had brown sugar and used that. Thank you SO much! I have been gluten free since 1993 because of celiac disease. I made your recipe using King Arthur gluten free baking mix , gluten free oats and brown sugar. It turned out beautifully and so delish! All these fruit combinations you mention sound great.Want to know the best? Blueberries and pears. This was an accidental (but very happy) discovery made one day when I didn’t have enough blueberries for a pie, and looked around to see what else I could put with them. I’ve used this for pie, for crisp and for jam–roughly equal proportions of the berries & the pears, or whatever you have. I accidentally used a tablespoon of baking powder! So, then I added more flour (half whole wheat), butter, and sugar without measuring, oh and I added in some oatmeal too. I made it with strawberries and peaches (no rhubarb). And for all those changes, it’s still really, really great! Thanks! I just made this with 3 cups of wild blueberries and 2 1/2 cups rhubarb. I increased the sugar to 2/3 cup. It was amazing! Thanks for another wonderful recipe! This is such a great & versatile recipe – and the topping is perfect. Today’s version is peach/blueberry/raspberry, with lime (instead of the lemon) zest and juice. Used 1/2 the sugar for the sweeter fruit and all four tblsp of the cornstarch. I’m making this in individual cupcake foils for work…they probably won’t be in the oven as long due to their size, which do you think I should do, pre-cook the fruit a bit or just cut it up smaller? Oh, my. Had never cooked with rhubarb before. Had some sliced almonds and added those to the topping. This might be both the simplest and the tastiest dessert I’ve ever made! I love all the comments with variations… I just search for all the random ingredients I might sub in, and voila, someone has already tested it for me! Thanks, smitten kittens. I just tried this recipe and swapped out toronado sugar with brown sugar. My berries were an inch from death, as was the rhubarb. Holeeee crap was it good. slivered or sliced almonds would be a great addition – but this was a great alternative to the drudgery and inevitable doom of a pie. Can I double the recipe to make in a 13 x 9 dish? Would the cooking time vary? Thanks so much! I LOVE your site! You can. I don’t think it would add a lot of baking time. Just made this yesterday for Father’s Day, it was so delicious and could not have been easier to make. Definitely recommend it. I read that it takes more flour to replace cornstarch; if I want to use flour for the filling do I use 3-4 tablespoons, or should it be increased because of the swap? Danielle — Hm, I’m not sure. I usually use less flour because it doesn’t disappear as much into the mixture. The thing is, also, with crisps and crumbles, I don’t think you even need 3 to 4 tablespoons anymore. I’d probably halve it. It’s okay if the mixture isn’t very thick; it’s not like a pie, where you need a clean slice. When I made this, the topping didn’t clump together. It didn’t taste bad but it was more powdery and not cake-y. Should I add more butter? erb — If it didn’t clump, usually a spoonful less flour next time will do the trick. Harvested some rhubarb yesterday and made this. So yummy!!!! I do love rhubarb and look forward to it every year, now growing in my backyard. I usually wouldn’t come back to comment on a post this old but I feel the need to say this. I have made this crumble no less than ten times in the last three years because my in-laws love it so much they request for every spring/summer event, picnic, and birthday. So thank you Deb, for earning me raves and adoration from my incredibly picky mother-in-law. Hi Deb, do you know if Coconut Oil can be subbed for the butter in this recipe without issue? This is my favorite strawberry-rhubarb recipe and it’s so easy!! Do you have any suggestions to modify the recipe for Passover? Chiming in here to say that I made this with a gluten-free flour blend and it worked out just perfectly. As it turned out, the gluten-free guest at my dinner party was on a diet and didn’t want dessert, but the rest of us gluten-eaters happily ate it. I also made this in an oval pan that I estimated was slightly larger than a 9″ round, so upped the topping by 1/4 and stretched the filling with a few (out of season) apples I had on hand. This is an amazing recipe! I regularly make this for BBQs and just keep filling up bigger and bigger pans while keeping the ratios the same – recently I made 8x the recipe in two roasting pans to serve 40 people.I almost always use all rhubarb instead of half strawberries and increase the sugar in the filling to 3/4 cups. What inspired me to write this comment – I am a transplant to The South and last weekend we attended an event in the mountains of North Carolina where I brought this dish. Everyone raved about it and asked for the recipe, which I felt was high accolades coming from a group of people who consider rhubarb crumble a southern dish! I took this to a gathering and now have to get the recipe copied for several. really good! This is my absolute favorite crumble topping- I use it for all different types of fruit fillings! Thanks! I love this crumble topping so much that I double the crumble! I especially enjoy the crunch and add slivered or sliced almonds to give it an extra oomph. Ive made this several times even with different fillings. Great recipe, thanks for sharing! Well drat. I forgot to get lemons, but I have made this recipe every summer for a few years and it’s pretty much the only way I eat rhubarb. Think substituting with an orange would be good? I forgot lemons, also, and used a splash of fancy white balsamicish vinegar – it turned out beautifully. I think any sweet/sour acid might work? I have to say, I was somewhat skeptical this recipe. Firstly because I’m not the biggest rhubarb fan, and secondly I’ve never made a crumble topping with melted butter before; and as I made it I thought ‘this is never going to work – I’ve just got a big lump of dough.’ But oh what a sticky sweet and tart delight! It is especially good with home-made custard and devouring the lot made my evening. Thank you! Note: I only added 2tbsp of cornflour as I was scared about it being doughy. And I prepared the fruit overnight before draining some of the excess liquid and cooking the next day. This is one of my favorite desserts. I love it the day after it’s made – cold with a little creme fraiche on top! I am sure you would love it! Can another flour be substituted in the crumble topping? Almond flour or some other? I’m making this for a friend who avoids wheat flour. Hm, do you think frozen strawberries would work/taste ok? I have rhubarb but no fresh strawberries yet this spring. Would you microwave thaw them first? Thanks! First, this is the best strawberry rhubarb dessert I’ve ever had. Amazing depth of flavors. Second, how do you not eat all the topping before it gets in the oven?? I bought 1 and 1/2 lbs of rhubarb and two quarts of strawberries at the farmers’ market and debated whether to make a double recipe of this crumble or a pie. This won. Having read the comments and the pie recipe, I used 1/4 c of tapioca from the pie recipe instead of the cornstarch, and that worked great. While I had roughly twice as much fruit as this recipe calls for, I had enough butter to make only 1.5 times the topping. Even that seemed like way too much when I put it on the fruit in my 10″ deep dish pie plate, so I baked some of it separately. (My topping also didn’t come out in lumps but was more like wet cookie dough, so I put it in little pieces on the fruit.) I was wrong. The topping is delicious and, most importantly, not too heavy, and more would have been even better. Next time I will cut the rhubarb in slightly smaller pieces, as 1″ is a little large since the rhubarb held its shape. I’m already thinking of how if I put this on yogurt I can transform it from dessert into breakfast. This a great way to celebrate the brief rhubarb/strawberry season. I love strawberry rhubarb! i grew up with a rhubarb patch in my backyard, so we ate a lot of it, i often ate it raw (yuck!) or stewed with sugar, but strawberry rhubarb has always been my favourite combo! I got some rhubarb in my produce delivery, so i made this! and it was DELICIOUS! i used the 4 tbsp of cornstarch, but will use 3 next time, the filling is a little thicker than i’d like, but still totally delicious. I love how this is not super sweet and the tart rhubarb comes through. The topping is soooo amazing! this recipe is a keeper. This had rave reviews when I served it at a lunch party – everyone had seconds! Plus – ridiculously easy to throw together. This recipe is a keeper. I made this and it turned out great! I adore rhubarb but my husband isn’t a fan unless it is accompanied by strawberries so this worked for him too. I do have a question about ‘juice of a lemon’ however. I have a lemon tree and my lemons when ripe are all different sizes so could have anywhere from 2 tablespoons of juice to 4oz of juice. Can I get a good estimate of how much is meant by juice of one lemon? I often get 1/4 cup with an electric citrus juicer. Glad it was a hit. Guuuuurl. Unbelievably delightful! Other than making it gluten-free (which the recipe translated perfectly with GF flour), the only thing I changed was using an orange instead of the lemon (since that’s what Ina Garten does), and it was superb! Great recipe! Thank you! Made this tonight making a few changes and it turned out well; great with vanilla ice cream. I halved the flour, using old fashioned oats for the other half. Added ~1/4 c more rhubarb and less strawberries. My strawberries were not as ripe as I prefer so I added an extra 2 tbsp granulated sugar; I probably could’ve gone with just 1 tbsp. Also added 1/4 tsp of vanilla extract to the filling. I forgot to mention that I added 3/4c oats, 1c flour, pecans, and a tsp of almond extract into the topping. Boy was this awesome and the crust was elprimo. Great recipe! My son especially enjoyed the topping and has requested it over apple pie filling. I didn’t have rhubarb, but I had frozen cranberries. I cooked them over the stove with some sugar and the juice of one orange. I added this to the strawberries and also included cherries and a couple of peaches. Everything else was the same. It was delicious. I’ve made this a few times now, I love it. Rhubarb has been ridiculously expensive and so I’ve never used it but instead a couple of apples (pink lady variety that is delicious when cooked and holds its shape available in Australia). My only tweak I consistently do is up the vanilla because I think that the apple + strawberry + vanilla with the hint of lemon is MAGICAL. I made this this weekend, subbing 4c of blueberries for the strawberry/rhubarb, and it was AMAZING. It maybe could have taken another cup of blueberries, but it was darn near perfection as is. I just made this with 2 quarts of local blueberries and it was delicious! Love that its 10+ years on and people are still commenting — it’s that good! I might try adding some oats or something next time to give the crumble a more complex texture, but wow so light v. the intense blueberry flavor. Thanks! I made this today for my cousin’s birthday and it was fantastic! I did, however, have a request from the birthday girl to leave out the strawberries so I used 5 cups of rhubarb and tripled the sugar in the filling to compensate for the resulting lack of sweetness. I also cut the pieces of ruhbarb a bit smaller, added another 2 TBSP of arrowroot powder (I was out of cornstarch) to the filling, and 2 more TBSP of butter and 3/4 cup rolled oats (another birthday girl request) to the topping. This may be my favorite Smitten Kitchen recipe ever. It is truly so versatile and yummy every time! At this point, I’ve made strawberry + rhubarb, blueberry + cherry, blueberry + peach, and apple crumbles, and they are all delicious. It’s so nice to have a recipe that is so malleable, too — I’ve used both cornstarch and flour in the filling, varying sugars and sweeteners, and varying amounts of butter based on what I had on hand. STILL GREAT! so when our trees are loaded with fruit, I will try other combinations. I made this with the frozen fruit I had on hand–2 1/2 C. raspberries, 3 C mango–no other changes. It turned out really well! the 6 stalks and it was 4 cups of Rhubarb. Just added a little bit more sugar and some cinnamon and followed the rest of the recipe and it came out picture perfect and delicious. Too bad our boys are not around any longer, they would have loved it too. Did you in any way defrost or cook the fruit first when you used frozen? No necessary here. Just give it 3 to 5 minutes extra to bake (you want the juices to be visibly bubbling through the crumbs in a spot or two). Just made it – smells heavenly! Can’t wait to try after dinner. This is a great recipe! I have 2 comments: this great recipe became an exceptional one with the use of orange instead of lemon zest/juice, and I like to double the topping recipe and freeze the extra to have on hand (then you can prepare this in no time at all…). In the British/NZ/Aust context of a crumble we wouldn’t melt the butter for the topping but rather cut it in cold and leave it rather lumpy and don’t overwork it – a bit like scones (biscuits). I also replace some of the flour in the topping with ground almonds and add a scant teaspoon of powdered ginger. Sometimes I add some rolled oats which encourages the idea ofeating leftover crumble for breakfast. Our crumbles also typically don’t have flour in the fruit mix but we would butter the baking dish generously before tumbling in the fruit and sugar and that with the bottom layer of topping seems to thicken the fruit just fine. It’s autumn in NZ so that means Feijoa and Apple Crumble. What about if we did this with tapioca flour? I used that for the last pie on your suggestion, and it worked great. Absolutely. It’s much more available these days, and my first choice these days. I have never been a fan of strawberry-rhubarb desserts, but hope springs eternal, so I tried this one. Finally, a strawberry-rhubarb dessert I love! The little crunch of the turbinado sugar is wonderful, and the addition of both lemon zest and juice brightens the filling. I think the recipe is perfect exactly as written. You are the dessert queen, Deb. I split this into 4 individual ramekins and baked it just shy of 30 min! Perfect! Thanks, Deb, for another winner! Amazing!! Easy and delicious! I used frozen strawberries and fresh rhubarb and it turned out great. I went a little crazy strawberry picking yesterday. I plan on doublibg the recipe-Can I freeze one? This crumble is so delicious in my fav rhubarb and strawberry season! So wonderful that these two lucious fruits ripen at the same time in our little midwestern town. I baked a beauty and am taking it to my parents tomorrow for an early 73rd Anniversary surprise. I did sneak just a little to taste just to make sure it was celebratory perfect! Thanks for a wonderful recipe! I’m dairy free these days – any butter alternative that I can use for the topping? Earth Balance butter is popular among the vegan bakers I know. This is great although I did not follow the whole recipe. Instead of the crumble topping I used the cornmeal topping from the peach blueberry cobbler recipe to better mimic a strawberry shortcake my husband had recently. Let the filling cook about 20 min before adding the topping. Was awesome! Thank you! A scoop-full of this crumble the next morning on some plain Greek yogurt made an amazing breakfast. Can this be prepped ahead of time and baked when company arrives? Great! Would you refrigerate it? If more than a day, yes. Are there any issues with using frozen Rhubarb and frozen berries? — maybe just more corn starch? Thank you!